Backgrounder: Meritage (pronounce like ‘heritage’, no French style accent) wine, blends made in the tradition of the great wines of Bordeaux can only carry the name if the winery is a member of The Meritage Association based in Sonoma County. Most wines made in the US are varietal wines, comprised of over 75% of a single varietal. Unfortunately, this labeling requirement is believed to impair many winemakers from making exceptional blends, since they are often labeled as simply Red Table Wine with the noble grapes of Bordeaux. Thus in 1988 Meritage was born as a way to highlight the winemaker’s art of careful blending and crafting of wines in the tradition of some of Europe’s finest wines. Today’s selection is 58% Cabernet Sauvignon, 34% Merlot and 8% Petite Verdot and is aged for 14 months in French and American oak, 40% new. Look – This wine shows very dark red, with a darker garnet heart and a vibrant brighter rim of pure ruby. When swirled, the edges of the glass are coated and skinny wine-stained legs move quickly down the glass. Smell – The bouquet is fruity and has lots of red berries and sweet oak shadings. Pronounced black cherry and cranberry lead the fruits. These are followed by soft chocolate and hints of sagebrush and anise. Feel – Lush and smooth, but with a distinct Cabernet character that is clearly in charge here. Everything feels round and smooth with ripe soft tannins. Taste – Loads of fruit and easy textures that showcase the red fruits, polished and easy, but with a real fruit forward style that Estancia is known for, with black cherry, raspberry, currant and plum layers. Finish – The finish is full and rounded with nice length, with the Cabernet flavors staying on for a long time. The Petit Verdot leaves a pretty spicy element as well that lingers on and on. Conclusion – Founded in 1986, by Augustin Huneeus, Estancia has been crafting great wines for years. Today’s wine reinforces Estancia’s history of offering clean and well made wines for a fair price. This wine shows all the pleasures that Paso Robles has to offer with lush fruit and easy tannins, making for a perfect wine for novices and wine lovers alike. This juicy Paso Meritage is truly a wine for everyone. Enjoy this wine on its own, or with hard cheeses, game or lamb. WINEMAKING PHILOSOPHY: Estancia’s winemaking philosophy continues to be firmly rooted in terroir, with the goal of producing wines that reflect the unique vineyards and appellations in which they are cultivated. 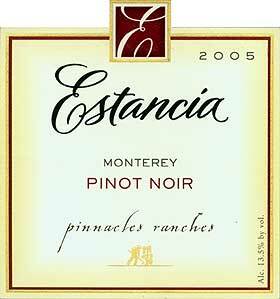 CAREER HIGHLIGHT: Becoming GM and Director of Winemaking at Estancia. AGENT RED: Greetings, Scott. We are thrilled to be showing your 2006 Estancia Reserve Meritage today. Thanks so much for taking some time to answer questions for our Operatives today. SCOTT: Thank you very much. Always happy to chat with the Wine Spies! RED: Was there a specific experience in your life that inspired your love of wine? SCOTT: I knew I wanted to do this since I was seventeen. I grew up in agriculture family and had an early interest in chemistry while in high school. I really found winemaking to be the perfect blend of agriculture and chemistry. My older brother was into viticulture as well, so that probably influenced my career direction a bit. RED: And where did you learn the most about winemaking? SCOTT: Growing up I had a lot of varied interests, not just in oenology but also in food science, so I pursued studies in Fermentation Science at the University of California at Davis. In addition to winemaking, I also explored the principles and science behind distillation, food engineering and even a little cheese-making. Since my brother and I were experimenting with home brewing during the summers, I took the opportunity to study at Davis’ Institute of Brewing Studies, eventually earning a Master Brewers Certificate. After Davis, I joined the Carmel Brewing Company, and eventually assembled a brewpub in Monterey from the ground up, formulating the recipes and brewing all the beer that we would serve on tap. I had always enjoyed the engineering side of things such as fluid dynamics and heat transfer, and working in a small brewpub allowed me to be hands-on throughout the brewing process and use some of the mechanical skills I learned growing up. Ultimately though, I found that brewing didn’t really fulfill my creative side, and I found myself gravitating back toward winemaking. In 2000, I joined the Robert Mondavi family of wines working on a variety of brands that took me from Australia to Italy. These experiences abroad really shaped my philosophy about wine and winemaking, my travels to Italy clarified the synergy between wine and food, while making wine in Australia introduced me to a new approach with a focus on the details and the idea that you only get one chance to make a wine great. RED: What is your winemaking style or philosophy? SCOTT: Winemaking fulfills my artistic side without giving up the innovative hands-on experience that keeps me in touch with my family’s roots in agriculture. I enjoy all of the challenges that each vintage presents in order to shape the style of wines we make at Estancia.. Our winemaking style is one that fully embraces the coastal terroir. RED: Tell me, what makes the Monterey and the Central Coast region so special? SCOTT: Born and raised in Monterey County, I have tremendous respect for the climate – the wind and fog and the impact it has on the fruit and wine. Whether it is using less oak in the Chardonnay to protect the tropical characters or fermenting Pinot Noir only in open-top fermenters to respect the silky tannins, I am really passionate about making estate-based wines that have truly have a reason for being. SCOTT: Estancia Meritage is a sophisticated, rich, complex and luscious wine harvested from the distinctive terroir of our Keyes Canyon Ranch and the Paso Robles AVA.. The 2006 Meritage was a blend of 58% Cabernet Sauvignon, 34% Merlot, 8% Petite Verdot. This wine has vibrant, dark black cherries with hints of anise, rosemary and sage. Accents of chocolate powder and soft oak. Intense flavors of chocolate dipped black fruit, accompanied by notes of sweet oak. Wonderfully structured ripe tannins lead to a nice long, fruit driven finish. In 1999, Estancia planted its Keyes Canyon Ranch, covering nearly 700 acres of vineyards in appellation of Paso Robles. This unique appellation is home to more extreme temperature swings than any other wine-growing region in California. During the day, the vines bask in the warm sunshine and at night they are soothed by a cool marine layer from the Pacific Ocean. In addition, the infertile soils and rugged terrain of Keyes Canyon, encourages the vines to yield small fruit clusters with tiny berries packed full of rich berry tones. The 2006 harvest was compact due to a wet spring, cooler than average summer, and then a record blast of heat at veraison. September 26th marked the beginning of harvest which continued through October 26th. SCOTT: I think this wine is very versatile, but it would marry particularly well with steak or nicely grilled rack of lamb. SCOTT: When I am not making wine, my fiancée Dena and I try to find time to pursue one of our many hobbies. We golf, cook, hunt, scuba diving and we go fly fishing for Steelhead in Oregon. RED: What is your favorite ‘everyday’ or table wine? SCOTT: It’s tough to pick a “favorite” as it really depends on what time of year it is or what we might be enjoying for dinner. Pinot Noir is always a favorite, and I have to say that that the more we play around with the Grenache fruit that we have on some of our Estate properties the more excited I am getting about that varietal. RED: Thank you so much for your time. We learned a lot about you – and about your wine. Keep up the great work, we are big fans! SCOTT: Thanks, this has been a lot of fun. I hope everyone enjoys the Meritage…it’s one of my favorite wines to make each year. The location of the Estancia Winery can be seen in this satellite photo. Today’s Russian River Valley Pinot Noir is made from the finest Russian River Valley fruit – from some of the most famous vineyards in the region. Whenever we showcase a wine that really stands out, we issue a special alert like this one! Read more about this wine on The Wine Spies. WINEMAKING PHILOSOPHY: New world winemaking is the goal. I treat the grapes very gently on the front end to create more elegant, fruit-forward wines with a shorter aging time. AGENT RED: Greetings, Chris. 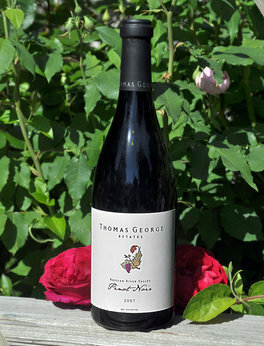 We are thrilled to be showing your 2007 Russian River Pinot Noir today. Thanks so much for taking some time to answer questions for our Operatives today. CHRIS RUSSI: Hey, Agent Red! CHRIS: Wine has been a part of my life since I was young. I was drinking wine mixed with water at the dinner table as far back as I can remember. The specific experience probably came when I made wine with my grandfather in the early 90’s. CHRIS: Daryl Groom, Mick Shroeter, Matt Gant. CHRIS: Soil and Climate. We have some of the most diverse soils in the world, for example, on our Baker Ridge Vineyard we have five different soil types across 24 acres. The climate is also ideal for growing Pinot and Chard…cool, fog laden mornings with warm to mildly hot afternoons. CHRIS: Just finished a bottling last week…5800 cases, 18 different wines, 4 days. Lots of vineyard designate wines.